just to say hello and to remind all that it will eventually warm up so keep the faith! Thank you BENSH!, nice looking outfit!. Didn't run it down the road any all last year, can't even find the license plate. Apparently ripped it off the bumper working back on a fence row. 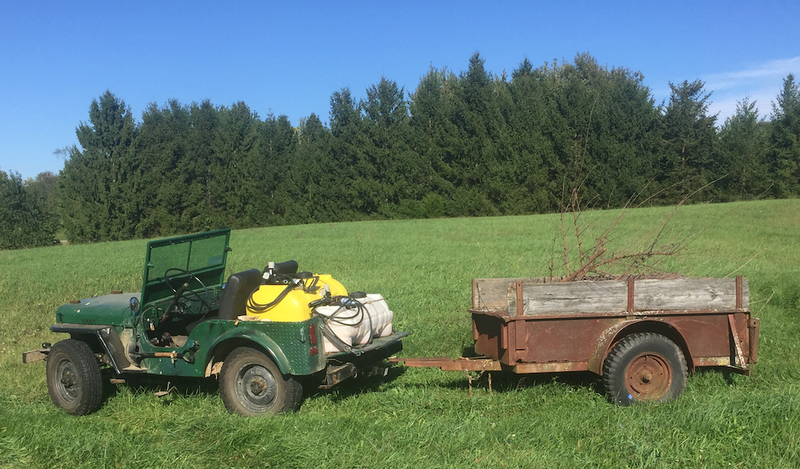 We get a lot done around my place with the jeep but guess I'm kind of rough on it, but as Dad always said about his heavy equipment, "it was made to work". The jeep has proven to be a great asset though. It will go up the frozen creek bank pulling the small trailer with a load of wood- and our old Massey wouldn't! The larger yellow tank has water with a bit of Seven liquid diluted. I burn a bit of brush and the fire control efforts have paid off. It's surprising how fast a fire will sweep down corn stubble in the middle of winter. I also use that tank to spray the trees for worms a couple times a year. Bagworms have been rough on the walnuts and even into the oaks and pines the last few years. The smaller tank has a 2-4D mix for keeping the Canadian Thistle down. Between mowing what I can get to and spraying the rest it's working out. Only thing I'm missing is the tank for the Round-Up but thinking about trying to put together one of the parts jeeps with an extended flat bed and wire the aux batt so it can get a charge when I'm working it and a bit more room for another small tank. Did have a nice Bantam but when I found the old Sears I though just leave it rough and let ir work.